Systemic sclerosis (SSc) is a multisystem autoimmune rheumatic disease characterized by obliterative microvascular and proliferative small artery alterations, a distinct autoimmune response and deposition of collagen and other matrix constituents in the skin and target internal organs. SSc presents with a number of coetaneous manifestations: skin sclerosis, dyspigmentation, intradermal and subcutaneous calcinosis, telangiectasia, and ulcerations/scars. Skin sclerosis represents the clinical hallmark of the disease. Dyspigmentation mainly occurs in patients with diffuse disease, who can show areas of skin hyperpigmentation containing areas or spots of hypopigmentation and sometimes giving a “salt and pepper” appearance. Intradermal and subcutaneous calcinosis consists of hydroxyapatite deposits which range from small to large lesions and can complicate with crystal-induced inflammation and/or skin ulceration. The induration of the skin represents a clinical finding shared by many different diseases: systemic sclerosis, toxic oil syndrome, eosinophilic fasciitis, eosinophilia-myalgia syndrome, morphea, graft versus host disease, nephrogenic fibrosis, vinyl chloride disease, scleredema of Buschke, human adjuvant disease, scleromyxedema, diabetic sclerodactyly, and stiff skin syndrome. These syndromes can be differentiated from SSc by the distribution of skin sclerosis, which in SSc is bilateral and symmetrical and always involves fingers. 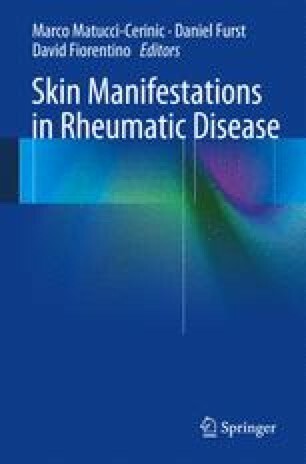 The treatment of skin involvement in SSc similarly to that of the whole disease can be classified into two headings: supportive and disease modifying.